Home|Articles|How Does an Automatic Induction Cap Sealing Machine Work? How Does an Automatic Induction Cap Sealing Machine Work? The sealing is an important process in packaging. It helps producers to maintain product integrity that enhances the trust of consumers. It also benefits consumer to get the genuine products without any sort of adulteration and pilferage. In short, it boosts brand value of products and customer satisfaction. The seal promotes clean and safe transportation of products as it prevents chances of leakage. Thus, it helps in protecting and increasing the shelf life of the content in containers. The advent of Induction Cap Sealing Machine has made dramatic changes in the process. It helps in easy and speedy sealing. The method is used for different types of containers and mostly used for foods, drugs, chemicals and petroleum products. The Heat Induction Sealer (HIS) or Heat Induction Liners play a crucial part in the sealing process. HIS Liner consists of four layers viz. Pulpboard, Wax, Foil and Polymer Coating. They are available in different sizes to meet almost any standard or customized packaging requirement. Induction sealing is a non-contact method of heating an inner seal to hermetically seal the top of plastic and glass containers. This process takes place after the container is filled and capped. The closure is supplied to the container with a liner. The container is allowed to pass under an induction coil which emits an oscillating electromagnetic field. Upon passing through the induction coil, the foil begins to heat due to electric currents. The heat melts the wax, which is absorbed into the pulpboard backing and it releases the foil from the cap. The polymer film also heats and flows onto the surface of the container. Once temperature cools down, the polymer creates a bond with the container resulting in a hermetically sealed product. This sealing process does not create any negative effect on the container or its content. The High-speed power analysis techniques such as Voltage and Current measurement is used to intercept power delivery from mains to generator or generator to head in order to calculate energy delivered to the foil and the statistical profile of the process. Sealing systems require less power resource, deliver instant startup time, and have a sealing head which can match to any size of container. However, it is recommended to always test the products prior sealing the large batch as the quality of plastic or glass container, liner and closure may differs, which may require different setting of timer and voltage. Why Choose Us? 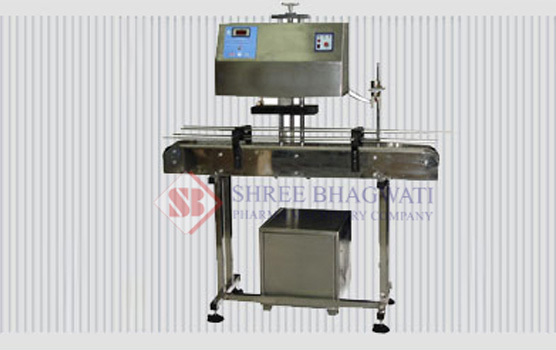 Shree Bhagwati Labeling Technologies is one of the foremost manufacturer and supplier of Automatic Induction Cap Sealing Machine. The company offers a wide range of machines which includes Ampoules Sticker Labeler, Self Adhesive Sticker Labeling Machine, Bottle Labeling Machines, Labeler Machine and also supplies Self Adhesive Labels Rolls. The organization is equipped with state of the art manufacturing system, excellent R&D Capabilities, and skilled engineers who manufacture the finest and customized machines for our well-regarded clients across the globe. We believe in providing a fantastic user experience to our clients and thus, we assist them with best after sale services globally.